Kolkata airport is an international airport but about 85% of its passengers are domestic travelers. It's India's fifth busiest airport and handled 19 million passengers per year in 2017. According to information released by the Airports Council International (ACI) in April 2018, Kolkata is now India's fastest growing airport. Passenger traffic increased by 27% over the past year. Further increases are expected following the launch of the government's Udan regional air connectivity scheme in April and May 2018. The airport is government-operated by the Airports Authority of India. A much needed, new and modern terminal (known as Terminal 2) was constructed and opened in January 2013. The airport's makeover resulted in it being awarded Best Improved Airport in the Asia-Pacific Region in 2014 and 2015 by the Airport Council International. 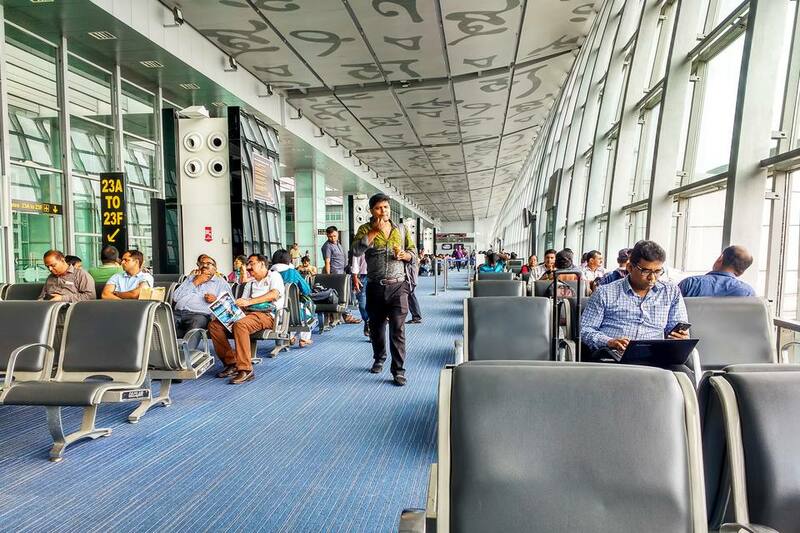 While Kolkata airport is presently a major center for flights to Northeast India, Bangladesh, Bhutan, China and Southeast Asia, it's hoped that the new terminal will attract more international airlines to service the city. However, the airport is already about to reach its existing capacity of 20 million passengers, necessitating further expansion. This is planned to be undertaken in two parts, involving linking the old airport terminal with the new one and then building a third terminal. This will double the airport's capacity to 40 million passengers by 2021. What's commendable is the airport has started using solar power, from solar panels installed on the premises, for its day-to-day operations. The main complaints that passengers have regarding the airport are inefficiencies and poor functionality. This includes poor maintenance, long lines at immigration, and lack of trolleys. Netaji Subhash Chandra Bose International Airport (CCU). It was named after a prominent leader of the Indian independence movement. Dum Dum, 16 kilometers (10 miles) northeast of the city. 45 minutes to 1.5 hours. The new five-level, L-shaped Terminal 2 replaces the old domestic and international buildings. It integrates both international and domestic flights. Passengers can disembark from any point and proceed to either the international or domestic sections of the terminal as necessary. The design of Terminal 2 is minimalist, with stark steel and glass. The ceiling is interesting though. It's adorned with the writings of famous Bengali poet Rabindranath Tagore. Previously, the terminal wasn't very engaging and lacked things to do. However, a number of retail stores opened in 2017, in both the domestic and international sections. The stores feature well known brands of apparel, leather goods, shoes, luggage, and cosmetics. The airport's duty free section is also being enhanced. Terminal 2 has 104 check-in counters, 44 immigration counters, 16 baggage carousels, and 18 aero-bridges. Inline baggage screening operates in the international departures area of the airport but bags still need to be manually scanned before check-in for domestic departures. Inline baggage screening machines are expected to become operational in the domestic section by October 2018. Free Wireless Internet is available at the airport for up to 30 minutes. You'll need to receive a PIN via text message on your cell phone to use it. There are ATMs in the departures and arrival areas. You may be charged a 200 rupees fee for using them, depending on the bank. There are also money exchange counters open 24 hours. There's a range of restaurants, including a food court in the domestic departures area. Air India and Jet Airways provide passenger lounges. There are Travel Club lounges in both the domestic and international departures areas of Terminal 2. The international lounge is open 24 hours a day, while the domestic lounge is open from 4.00 a.m. until 9.00 p.m. Alcohol is not available in the domestic lounge. These lounges can be accessed by selected airline passengers, Priority Pass holders, holders of certain credit cards, and passengers who pay to enter. 12 new retiring rooms opened on the mezzanine floor of the airport terminal, accessible through the arrivals area, in early 2016. Passengers must make bookings in person at the Airport Manager's office on the departures level, accessible through Gate 3C, or by sending a fax to +91 (033) 25118877. Expect to pay 1,000 rupees for a bed (twin sharing) in a double room or 700 rupees in a dorm room. The airport has a luggage storage facility, where luggage can be kept for up to 30 days. The facility is open 24 hours. Bookings can be made at Counter 18 in the arrivals area (near Gate 3C) and the Airport Manager's office in the departures area (Gate 3C). The cost is 20 rupees per bag for up to 24 hours. Beyond that, the charge is 40 rupees per bag, per day. The cheapest and most convenient way to get to the city center is to take a government prepaid taxi. These taxi operate 24 hours. There are booking counters inside the terminal is near Gate 3C, and outside the terminal opposite gates 4A and 4B of the arrival level. Further counters are planned to open near near gates 1A and 2. A fare to Sudder Street is about 350 rupees. Be careful of touts outside the terminal who will direct you to other "luxury" taxi counters, where the fare will be much higher. There's also a kiosk run by a private operator Mega Cabs, which has cleaner but slightly more costly taxis. They are metered taxis. The driver will give you a receipt at the end of the journey and you'll pay him cash. Alternatively, if you have Internet access, Uber and Ola Cabs operate from the airport. Many hotels will offer airport pick-up for a fee as well. Dense fog hangs over Kolkata airport from late December to early January, between 2 a.m. and 8 a.m. This causes regular flight delays during these times. Travelers should take this into consideration when making plans. Unfortunately, the new Terminal 2 doesn't have a transit hotel (yet). The old Ashok airport hotel has been demolished, and two new luxury hotels and a shopping mall are to be constructed in its place. If you need to stay near the airport, there are a few decent enough options (and plenty of awful seedy ones!) to suit all budgets. This guide to Kolkata airport hotels point you in the right direction.